A Stanfield Tiger connects on a pitch. STANFIELD - The Stanfield Tigers defeated the Knappa Logger 8-3 on Friday, March 27, 2009. It was an overcast and breezy afternoon for the Friday game. 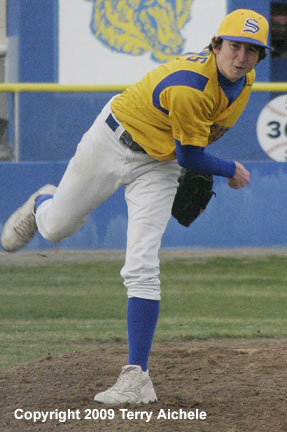 Trey Blevins was the winning pitcher for Stanfield. The Tigers held the Loggers scoreless until the fifth inning. Quin Grogan scored on a double by Mike Fisher in the bottom of the fourth to give Stanfield the 2-0 lead. The Tigers scored again in the bottom of the fourth when Shawn Milbrodt hit deep into left field driving in Devin Bailey. Milbrodt scored moments later on a sac fly to right field by Trey Blevins. Stanfield led at the end of the fourth 4-0. Knappa scored in the top of the fifth on a hit to right field bringing in the runner from third base. Stanfield scored in the bottom of the fifth when Mike Fisher came in on a hit to right field by Derek Monkus. Monkus scored a few plays later on a pop fly behing first base by Milbrodt. Stanfield led 6-1. The Knappa Loggers scored twice early in the sixth inning on hits to right field and second base to close the Stanfield lead to 6-3. Quin Grogan scored from third base on a grounder and force out that allowed Grogan to get home. Along flyout to center field allowed the last Stanfield run to score. Stanfield notched another win for the week, 8 to 3. LEFT - Mario Madrigal, number 22, slides into second base during the game on Friday afternoon. 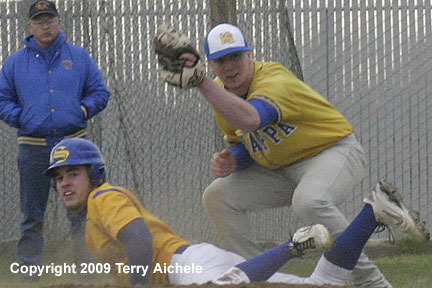 RIGHT - Stanfield catcher Mike Fisher looks up after sliding into third base. 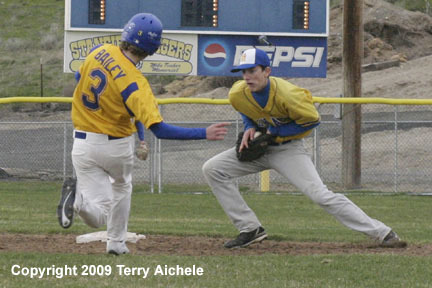 LEFT - Devin Bailey of Stanfield races to second base while the Knappa secondbaseman positions himself for a throw. 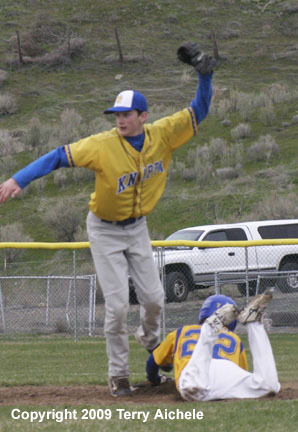 RIGHT - Trey Blevins was the starting pitcher for Stanfield on Friday. 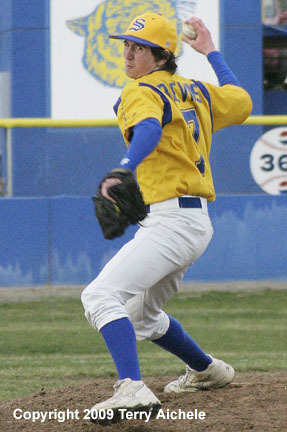 LEFT - Trey Blevins of Stanfield follows through on a pitch. 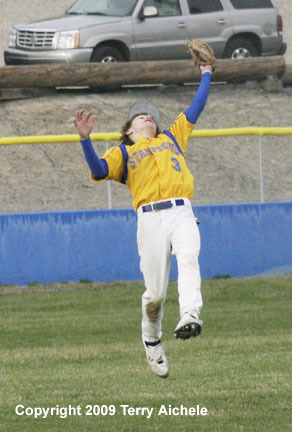 RIGHT - Devin Bailey of Stanfield leaps to catch a line drive during Friday's game. 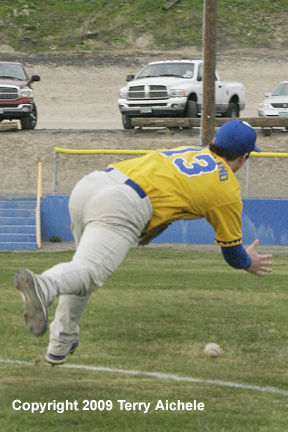 LEFT - Knappa Logger first baseman Strickland mishandled a fly ball late in the game. 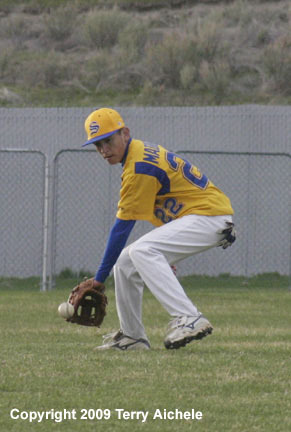 RIGHT - Mario Madrigal of Stanfield fields a ball during the game.